Sadeghi-Aliabadi, H., Ghasemi, N., Fatahi, A. (2006). Cytotoxic Effects of Iranian Mistletoe Extract on a Panel of Cancer Cells. Iranian Journal of Pharmaceutical Sciences, 2(3), 157-162. Hojjat Sadeghi-Aliabadi; Nasrollah Ghasemi; Ali Fatahi. "Cytotoxic Effects of Iranian Mistletoe Extract on a Panel of Cancer Cells". 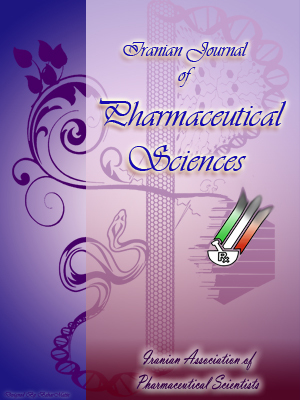 Iranian Journal of Pharmaceutical Sciences, 2, 3, 2006, 157-162. Sadeghi-Aliabadi, H., Ghasemi, N., Fatahi, A. (2006). 'Cytotoxic Effects of Iranian Mistletoe Extract on a Panel of Cancer Cells', Iranian Journal of Pharmaceutical Sciences, 2(3), pp. 157-162. Sadeghi-Aliabadi, H., Ghasemi, N., Fatahi, A. Cytotoxic Effects of Iranian Mistletoe Extract on a Panel of Cancer Cells. Iranian Journal of Pharmaceutical Sciences, 2006; 2(3): 157-162. Extracts derived from Viscum album have been shown to kill cancer cells in vitro. Some studies have noted that different species of this plant collected from around the world displayed cytotoxic effects in different extents. In the present study, we evaluated the effects of Iranian mistletoe extracts on five cancer cell lines. Plants growing on hornbeam tree (Carpinus betulus) were collected, air-dried and hydroalcoholic (MeOH-H2O with 2% acetic acid) and methanolic extracts were obtained using percolation. Also the plant juice was obtained by pressing. Cytotoxicity of the extracts on a panel of cancer cells (Hela, KB, MDA-MB-468, K562 and MCF-7) were studied using colorimetric MTT assay. Results showed that plant juice was the most cytotoxic fraction on all cancer cells tested (IC50=0.0316 mg). The IC50 of hydroalcoholic and methanolic extracts were 0.1 and 0.316 mg, respectively. These results suggest that alkaloids and huge compounds like viscotoxin and lectins extracted by press or hydroalcoholic solvents were probably responsible for their cytotoxicity. Results also indicated that Hela cells were more resistant while KB cells were more sensitive to the cytotoxic effects of the extracts. It can be concluded that cytotoxicity of Iranian mistletoe extract on the cell lines tested closely depends on the host tree and extraction methods. Mistletoe, a semiparasitic plant, growing on Ironwood or hornbeam tree (Carpinus betulus), holds interest as a potential anticancer agent because extracts derived from it have been shown to kill cancer cells in vitro [1, 2]. It also stimulates immune system both in vitro and in vivo [2, 3]. Two components of mistletoe, namely viscotoxins and lectins, may be responsible for its anticancer effects or its stimulating activity of the immune system [4-7], although many researches have focused on lectins. The three mistletoe lectins (ML I, II, III) have been identified as the main active principle of its extract. The in vitro growth of several types of human cancer cells was stimulated by treatment with low doses of the purified lectin ML-I . Mistletoe grows on several types of trees (oak, apple, pine etc.). The chemical composition of its extracts depends on the species of the host tree, the time of harvesting, the method of extract preparation, and the commercial producer [9, 10]. Mistletoe is used mainly in Europe, where commercially available extracts are marketed under a variety of brand names, including Iscador, Isorel etc. All of these products are prepared from Viscum album, Loranthaceae (V. album L. or European mistletoe). Most of the researches have been performed on European mistletoe and a few on Korean mistletoe, but there is no report on Iranian mistletoe. The principles of mistletoe therapy were developed by the scientific investigation of Rudolf Steiner, who found that mistletoe constituents stimulate inflammatory processes in the body to combat tumor development . Preclinical studies carried out by Maier and Fiebig showed that European mistletoe extracts inhibited tumor growth in a panel of 16 human tumor cell lines in vitro . In another in vivo study, Burger et al. concluded that treatment with aqueous mistletoe extract, as an immuno-stimulating agent, did not enhance tumor growth in any of the syngeneic murine tumor models used . Also Gorter and co-workers showed that cytokine was released after incubation of two different V. album L. extracts with keratinocytes and cell viability was decreased in a dose dependent manner . In the present study, direct effects of hydroalcoholic or alcoholic extracts and juice of Iranian mistletoe were investigated on the growth of a panel of 5 human tumor cell lines in vitro. Leaves and berries of Viscum album L. were collected from the northern parts of Iran (Tosiyan village, Siahroud forest in Gilan province) at an altitude of 350 m in July 2002, and was identified by the botanists at Department of Biology, Isfahan University, Isfahan, Iran. Plant samples were stored at - 20 °C. A voucher specimen of the plant (No. 1252) is deposited in the herbarium of Faculty of Pharmacy and Pharmaceutical Sciences, Isfahan University of Medical Sciences, Isfahan, Iran. Air-dried parts of V. album were ground and 50 g of it was extracted with methanol (designated as methanolic extract in the following text) or a mixture of methanol/H2O (30:70) containing 2% acetic acid (designated as aqueous extract in the following text) by means of percolation. In another method 50 g of fresh leaves and berries of plant were chopped and pressed by means of special metalic syringe to obtain fresh plant juice (designated as juice in the following text) before using on cell lines. Preliminary phytochemical screening including the presence of alkaloids, flavonoids, tannins, anthraquinones, saponnins and glycosides were performed on extracts and juices of V. album as described in our publication . Hela (Human cervix carcinoma), KB (Human Caucasian/ epidermal carcinoma) and MDA-MB-468 (Human breast adenocarcinoma) MCF-7, K562 cell lines were obtained from Pasture Institute of Iran in Tehran. They were grown in RPMI-1640. Each 500 ml of RPMI-1640 was supplemented with 10% of fetal calf serum, 5 ml of penicillin/streptomycin (50 IU/ml1 and 500 μg/ml1, respectively), 5 ml of 1 mM sodium pyruvate, 1 g of NaHCO3, and 5 ml of 2 mM L-glutamine. Completed media were sterilized by 0.22 μm microbiological filters after preparation and kept at 4 °C before using. The viability of cells was studied by assessment of plasma membrane integrity as determined by trypan blue (0.2 % w/v) exclusion assay. Cells were in their exponential growth phase after 24 h and during next 3 days of incubation. All extracts were added to the cell suspensions after 24 h.
The cytotoxic effect of the extracts on the previously mentioned human tumor cell lines was determined by a rapid colorimetric assay, using 3-(4,5-dimethylthiazol-2-yl)-2,5-diphenyl tetrazolium bromide (MTT) and compared with untreated controls . This assay is based on the metabolic reduction of soluble MTT by mitochondrial enzyme activity of viable cells, into an insoluble coloured formazan product, which can be measured spectrophotometrically after dissolution in dimethyl sulfoxide (DMSO) . Briefly, 200 μl of cells (5 x 104 cells/ml of media) were seeded in 96 microplates and incubated for 24 h (37 °C, 5% CO2 air humidified). Then 20 μl of prepared concentrations of extract was added and incubated for another 72 h in the same condition. Doxorubicin was used as a positive control. The first column of each microplate was assumed as negative control (containing no extracts or doxorubicin). To evaluate the cell survival, 20 μl of MTT solution (5 mg/ml in phosphate buffer solution) was added to each well and incubated for 3 h. Then, gently 150 μl of the old medium containing MTT was replaced by DMSO and pipetted to dissolve any formed formazan crystals. Absorbance was then determined at 540 nm by ELISA plate reader. Each extract concentration was assayed in 8 wells and repeated 3-6 times. Standard curves (absorbance against number of cells) for each cell line were plotted. Intra-day and inter-day variations were determined. Growth inhibition/stimulation was expressed as treated cells/control × 100 (cell survival %). Cytotoxic activity was defined as inhibition of cell growth to less than 50% (IC50). Survival in negative control (medium-treated cells) was assumed 100%. Coefficient of variation [SD/mean × 100] was below 20% in nearly all experiments. SPSS software was used to perform statistical tests. One-way ANOVA followed by Post Hoc was used to distinguish the differences among groups. Significance was assumed at 5% level (p < 0.05). Preliminary phytochemical studies on the plant extracts displayed the presence of alkaloids, tannins, flavonoids and amino acids. Saponins, anthraquinones and glycosides were not determined in the extracts. The hydro-alcoholic extract was cytotoxic toward all cell lines tested in a dose-dependent manner (Figures 1 & 2). IC50 were about 562 cell lines, respectively (Figure 1). IC50for KB, MDA-MB-468 and MCF-7 cell lines were μg/ml, respectively (Figure 2). Figure 1. Dose response curve for Hela and K562 cell lines following 72 h continuous exposure to aqueous extract of Iranian mistletoe (n=3). Figure 2. Dose response curve for KB, MDA-MB-468 and MCF-7 cell lines following 72 h continuous exposure to aqueous extract of Iranian mistletoe (n=3). Results obtained from these studies showed that the order of cytotoxicity of 3 extracts against Hela cell line were juice > hydroalcoholic extract > methanolic extract. As shown in Figure 3, the IC50's were 0.0316, 0.1 and 0.316 mg/ml, respectively. Figure 3. Dose response curves for Hela cell line following 72 h continuous exposure to 3 different extracts of Iranian mistletoe (n=6). Extracts of V. album (mistletoe) are widely used as complementary cancer therapies in Europe. Although four species of mistletoe grow in Europe, only the white berried ones are used for cancer treatment. They are harvested from several deciduous hardwood trees (oak, apple and elm) and from coniferous softwood trees (pine and fir). The apple and pine-grown ones are common; the elm- and oak-grown ones, are less common . In this study, we used white berried Iranian mistletoe grown on Carpinus Betulus (betulaceae), an oak like tree. There are several reports indicating that biologically active V. album compounds, and thus cytotoxicity or apoptosis-inducing properties, are dependent on the manufacturing process, host trees, different geographical regions and time of harvest [18,19]. For instant European mistletoe has significant antitumor effect, while American V. album has no effect . The Korean mistletoe (V. album var. coloratum) showed better cytotoxic effect than the European mistletoe, and direct injection into tumors showed antitumor properties . Mistletoe contains, among other constituents, two groups of toxins: Viscotoxins and lectins. Mistletoe lectin (ML) is a ribosome inactivating protein consisting of two chains (A and B) joined by a disulfide bond. The toxicity of ML is mediated by the B-chain, which has lectin activity, interacting with sugar residues of glycoproteins and glycolipids on the surface of target cells . Percolation was used as a safe extraction method to extract most of these active proteins intact. Viscotoxin is a huge compound which is effected by high tempreture and can not be extracted by methanol alone, therefore, a mixture of methanol/water and 2% acetic acid was applied to complete the extraction. Acidic extraction solvent could help the extraction of nitrogen containing compounds like alkaloids, viscotoxin and lectins . Five different cell lines were used in these studies for several reasons; Hela as a resistant cell line and KB as a chemosensitive cell have been used commonly in anti-cancer screening of plant by NCI ; MCF-7 and MDA-MB-468 cell lines were used to evaluate the cytotoxic effects of the extracts on breast cancer as a common disease in most societies; K562 cell line was used to show the effect of the extracts on leukemia. Our results indicated that the hydro-alcoholic extract and the juice possess cytotoxic effects against all tested cell lines. These results also indicated that the hydroalcoholic extract of the Iranian V. album is significantly more cytotoxic than its methanolic extract (pbut there was no significant correlation between the hydroalcoholic extract and the juice. Stein and Berg in their studies provide evidence that immunological reactivity of patients with adverse effects towards Helixoer (an aqueous mistletoe preparation) are seldom . Lyu and co-worker  showed that the methanolic extract of the Korean mistletoe had cytotoxic effect indicating that beside lectins, there are some small compounds in this plant which could be extracted by methanol and may be responsible for its cytotoxic properties. Although cytotoxicity of V. album extracts is attributed to its viscotoxin and lectins, but Kuttan suggested that in addition to a direct cytotoxic effect of V. album extract, the activation of macrophages may contribute to the overall antitumor activity of the drug . Jurin and others in their studies showed that the combined action of Isorel, V. album L. preparation, influencing tumor viability on one hand and the host's immune reactivity on the other hand, seems to be favorable for its antitumor action in vivo . In the case of molecular mechanisms of mistletoe extract, Timoshenko and Gabius in their studies revealed that V. album lectins induce superoxide anion release from human neutrophils  or generate H2O2 . On the other hand, Thionines such as viscotoxin from mistletoe could induce human lymphocytes to generate reactive oxygen intermediates . V. album lectins are also cytokine inducers and immunoadjuvant in tumor therapy [14, 30]. Generation of superoxide anion or H2O2 could cause cell toxicity. Agglutinins, another V. album extract components, inhibited mammalian protein synthesis at nanomolar concentrations , increased the secretion of an active form of interleukin-12 and potentiated the cytokine-induced NK activation . In conclusion, the data indicate that juice or hydroalcoholic extracts of the Iranian misteletoe are cytotoxic against a panel of cancer cells in a dose dependent manner. Iranian mistletoe juice is more cytotoxic than European mistletoe because the host tree are different and also compounds extracted by hydroalcoholic extracts and pressing process are not probably the same. These studies were financially supported by the research council of Isfahan University of Medical Scinces, Isfahan, Iran. Franz H. Mistletoe lectins and their A and B chains. Oncology 1986; 43: 23-34. Mengs U, Gothel D, Leng-Peshlow E. Mistletoe extracts standardized to mistletoe lectins in oncology: Review on current status of preclinical research. Anticancer Res 2002; 22: 1399-407. Samtleben R, Hajto T, Hostanska K. Mistletoe lectins as immunostimulants (chemistry, pharmacology and clinic). In: Wagner H, (editor). Immunomodulatory agents from plants. Basel, Switzerland: Birkhauser Verlag, 1999, pp. 223-41. Schrader G, Apel K. Isolation and characterization of cDNAs encoding viscotoxins of mistletoe (Viscum album). Eur J Biochem 1991; 198: 549-53. Friess H, Beger HG, Kunz J, Funk N, Schilling M, Buchler MW. Treatment of advanced pancreatic cancer with mistletoe: Results of a pilot trial. Anticancer Res 1996; 16: 915-20. Grossarth-Maticek R, Kiene H, Baumgartner SM, Ziegler R. Use of Iscador, an extract of European mistletoe (Viscum album), in cancer treatment: prospective nonrandomized and randomized matched-pair studies nested within a cohort study.Altern Ther Health Med 2001; 7: 57-66, 68-72, 74-6. Sweeney EC, Palmer RA, Pfuller U. Crystalliza-tion of the ribosome inactivating protein ML1 from Viscum album (mistletoe) complexed with beta-D-galactose. J Mol Biol 1993; 234: 1279-81. Gabius HJ, Darro F, Remmelink M, Andre S, Kopitz J, Danguy A, Gabius S, Salmon I, Kiss R. Evidence for stimulation of tumor proliferation in cell lines and histotypic cultures by clinically relevant low doses of the galactoside-binding mistletoe lectin, a component of proprietary extracts. Cancer Invest 2001; 19: 114-26. Zee-Cheng RK. Anticancer research on Loranthaceae plants. Drug Future 1997; 22: 519-30. Kaegi E. Unconventional therapies for cancer: 3. Iscador. Task force on alternative therapies of the Canadian breast cancer research initiative. CMAJ 1998; 158: 1157-9. Gorter RW. Iscador. Congers, New York 10920, USA, 1998. Maier G, Fiebig HH. Absence of tumor growth stimulation in a panel of 16 human tumor cell lines by mistletoe extracts in vitro. Anticancer Drugs 2002; 13: 373-9. Burger AM, Mengs U, Schuler JB, Fiebig HH. Anticancer activity of an aqueous mistletoe extract in syngeneic murine tumor models. Anticancer Res 2001; 21: 1965-8. Gorter RW, Joller P, Stoss M. Cytokine release of a keratinocyte model after incubation with two different Viscum album L extracts. Am J Ther 2003; 10: 40-7. Ghassemi-Dehkordi N, Taleb AM. Isolation, identification and determination of medicinal plants constituents. Isfahan: Isfahan University of Medical Sciences Publication, 2001. Mosmann T. Rapid colorimetric assay for cellular growth and survival: Application to proliferation assays. J Immunol Methods 1983; 65: 55-63. Carmichael J, DeGraff WG, Gazdar AF, Minna JD, Mitchell JB. Evaluation of a tetrazolium-based semiautomated colorimetric Assay: assessment of chemosensitivity testing. Cancer Res 1987; 47: 936-42. Bussing A, Schietzel M. Apoptosis-inducing properties of Viscum album L. extracts from different host trees, correlate with their content of toxic mistletoe lectins. Anticancer Res 1999; 19: 23-8. Yoon TJ, Yoo YC, Kang TB, Shimazaki K, Song SK, Lee KH, Kim SH, Park CH, Azuma I, Kim JB. Lectins isolated from Korean mistletoe (Viscum album var. coloratum) induce apoptosis in tumor cells. Cancer Lett 1999; 136: 33-40. Wagner H, Jordan FB. Studies on the standardi-zation of mistletoe preparations. Oncology 1986; 43: 16-22. Stein GM, Berg PA Characterisation of immunological reactivity of patients with adverse effects during therapy with an aqueous mistletoe extract. Eur J Med Res 1999; 4: 169-77. Stettin A, Schultze JL, Stechemesser E, Berg PA. Anti-mistletoe lectin antibodies are produced in patients during therapy with an aqueous mistletoe extract derived from Viscum album L. and neutralize lectin-induced cytotoxicity in vitro. Klin Wochenschr 1990; 68: 896-900. Lyu SY, Park SM, Choung BY, Park WB. Comparative study of Korean (Viscum album var. coloratum) and European mistletoes (Viscum album). Arch Pharm Res 2000; 23: 592-8. Kuttan G. Tumoricidal activity of mouse peritoneal macrophages treated with Viscum album extract. Immunol Invest 1993; 22: 431-40. Jurin M, Zarkovic N, Hrzenjak M, Ilic Z. Antitumorous and immunomodulatory effects of the Viscum album L. preparation Isorel. Oncology 1993; 50: 393-8. Timoshenko AV, Gabius HJ. Efficient induction of superoxide release from human neutrophils by the galactoside-specific lectin from Viscum album. Biol Chem Hoppe Seyler 1993; 374: 237-43. Timoshenko AV, Dubovskaya LV, Karvatskaya OD, Zharkov VV, Gabius HJ. NO-dependent regulation of lectin- and menadione-induced H2O2 production by cells from pleural effusions of lung cancer patients and by immune cells. Int J Oncol 1999; 14: 793-8. Bocci V. Mistletoe (Viscum album) lectins as cytokine inducers and immunoadjuvant in tumor therapy: A review. J Biol Regul Homeost Agents 1993; 7: 1-6. Citores L, Ferreras JM, Iglesias R, Carbajales ML, Arias FJ, Jimenez P, Rojo MA, Girbes T. Molecular mechanism of inhibition of mammalian protein synthesis by some four-chain agglutinins. Proposal of an extended classification of plant ribosome-inactivating proteins (rRNA N-glycosidases). FEBS Lett 1993; 329: 59-62. Hajto T, Hostanska K, Weber K, Zinke H, Fischer J, Mengs U, Lentzen H, Saller R. Effect of a recombinant lectin, Viscum album agglutinin on the secretion of interleukin-12 in cultured human peripheral blood mononuclear cells and on NK-cell-mediated cytotoxicity of rat splenocytes in vitro and in vivo. Nat Immun 1998; 16: 34-46.